…Let’s face it. Nobody likes to visit their Ft Myers Dentist. But when the time comes and you need to visit your Fort Myers dentist, wouldn’t you want the dental visit to be completed as quickly and efficiently as possible? Maybe even faster than that! Good news! With the aid of 25 years of experience and today’s technological breakthroughs, our The dental office of Scott Trettenero DDS, can literally work dental miracles in just one visit. Is “miracles” too strong a word? Our Fort Myers dental patients don’t think so. It even amazes me how quickly and efficiently we can get things done. For example, with our state-of-the-art CEREC computerized technology we are able to restore teeth with super-strong, enamel-like, ceramic material that has the exact appearance as your natural teeth structure. In just one visit we can accomplish what normally takes at least two visits and we are able to do it better than the old ways in a lot of cases. Plus, by using our CEREC technology, we can save more of your natural tooth structure. This means we usually don’t have to cut the tooth down like before. Read about the dental technology you will find at the dental office of Scott Trettenero, DDS. 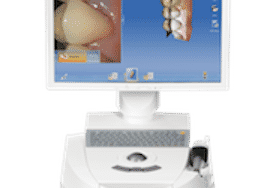 Not all Fort Myers Dentists are the same, see our web page on all the technological advancements you will find at the Dental office of Scott Trettenero, DDS. With our CEREC technology we can do full crowns when its appropriate, partial crown which allow us to save more of your tooth structure, plus create inlays and onlays too which are very conservative. I love to do these restorations because I do believe that saving as much of your natural tooth is very important. 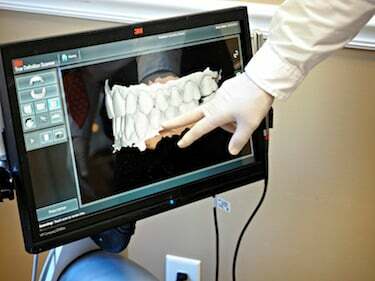 Nothing is better than your own teeth but when they need help, CEREC is the next best thing. There are other procedures that we routinely do for our patients that take only one visit. About 90% of the root canals we do are done in one visit. I find that it’s more comfortable, efficient, and effective to do them this way. No one wants to come back for another procedure which would include more numbing and fighting the dreaded Ft. Myers traffic! Within one hour or less we can complete this treatment. And most important, they’re not the frightening thing most people think they are. Quite the opposite, in fact. Can this Ft Myers Dentist offer Painless Root Canals? – The key to PAINLESS root canals is a generous amount of anesthetic given in the correct manner, fast and accurate instrumentation and using the right medicaments to complete them. “That wasn’t bad at all” is the usual comment. And that’s what I want to hear! Also, teeth whitening procedures can be done in one visit which includes making whitening trays. It’s a procedure that I perfected and I even received a patent on the process. Instead of taking the impressions in one visit and then having to return another day for the appliance, we can make them right on the spot. Saves you a lot of time. Plus, a special bite guard can be fitted in one appointment. This little gem is quick, easy, inexpensive, and extremely effective. And it’s comfortable to wear while you sleep because it’s so small. Our patients love it. All of our tooth colored bonded fillings too can be done in one visit. We use the latest bonding procedures to give you the best that’s available to date. It’s amazing what a difference getting rid of unsightly silver-mercury fillings can make in your smile! We haven’t used those fillings in over a decade.